What’s the Difference Between Soffits and Fascia? The soffits and fascia board are important parts of your roofing system. If they get damaged, it can cause serious harm to your attic and other areas of your home. Thompson Roofing & Reconstruction offers services for repairing or replacing soffits and fascia. Call our office today at (573) 789-8367 to schedule your next roofing appointment. The Soffits and Fascia on Your Home Are Very Important Parts of Your Roof. In order to help our staff understand what you need from us, it is helpful for you to tell us which part of your roof needs repair. Is it the fascia or the soffits. If you’re not sure which part of your roof is the fascia and which part is the soffits, here are some useful definitions for each. Soffits are essentially the underside of the eaves of your roof. The purpose of soffits is to prevent water from being able to get under the roof. They are usually made from vinyl or aluminum. Typically, if they need repairs it is for water damage. 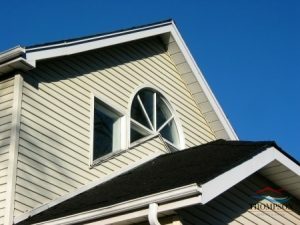 The fascia on your roof is the trim that runs along the edge. It’s purpose is to close of the end of the roof and protect the roof’s edge from water. It also provides your home with a clean, finished appearance. Typically, fascia is made from wooden materials, and it is most susceptible to overexposure to the UV rays of the sun. The soffits and fascia on your home serve very important functions for your roofing system. If they are damaged, call our office at (573) 789-8367 to get them repaired as soon as possible. Posted in Uncategorized on October 11, 2017 at 5:01 pm by Thompson Roofing & Reconstruction.